The union Philippine Airlines Employees Association (PALEA) welcomed the promulgation today of a decision by the Sandiganbayan regarding the mulcting case it filed against a prosecutor of the Department of Justice (DOJ). A delegation from PALEA came to the Sandiganbayan this morning to witness the promulgation. Senior assistant state prosecutor Diosdado Solidum is charged with extorting some P2.5 million in 2013 in exchange for dropping a case against 250 PALEA members for alleged violation of the Civil Aviation Authority Act (CAAP) of 2008 because of its airport protest against outsourcing in September 2011.The protest ended with the forcible eviction by police and guards of PALEA members. “We welcome the handing down of a decision today and we hope that the Sandiganbayan delivers a conviction on Solidum as there is incontrovertible proof of his guilt. A conviction will render justice for PALEA members whose protest against contractualization in Philippine Airlines (PAL) is not just legal but just. We hope that this small win will ultimately lead to a bigger victory in our fight against endo at PAL,” stated Gerry Rivera, PALEA president and also vice chair of the militant Partido Manggagawa. PALEA held a protest at the airport in September 27, 2011 in a bid to stop the implementation of a massive outsourcing program that led to the mass termination of some 2,600 employees and their transfer as contractual workers in agencies. PAL charged some 250 PALEA members with violating the CAAP law and a Pasay City prosecutor subsequently affirmed the complaint. Solidum then approached PALEA with the offer of dismissing the case on appeal in return for P10,000 from each of the respondents. Solidum was caught in an entrapment operation in QC authorized by then DOJ head Leila de Lima. “A few days ago President Rodrigo Duterte assailed Lucio Tan-owned PAL for failing to pay CAAP for its debts on the use of airport facilities. As a result PAL has offered to settle the issue by paying P4 billion. We call on President Duterte to ask Lucio Tan and PAL to likewise fulfill their obligation to some 600 PALEA members have yet to be reinstated as regular workers according to the terms of a settlement agreement forged in 2013 to resolve the outsourcing dispute. The President is aware of this as it was brought to his attention in a dialogue with labor groups at Malacanang last February 27,” Rivera insisted. 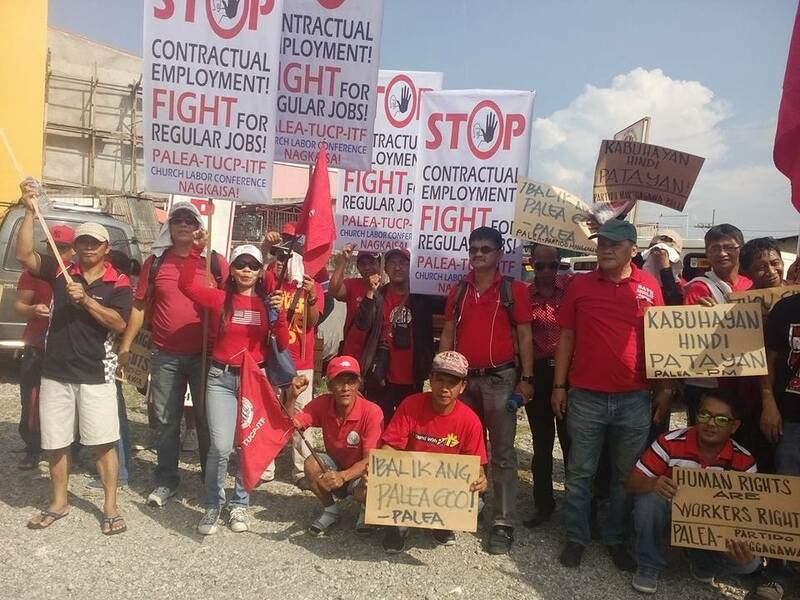 PALEA is also calling on the Department of Labor and Employment to release the findings of its inspection of PAL, its sister company PAL Express and the 27 agencies contracted in their operations. A similar inspection of telecom company PLDT led to an order to regularize nearly 9,000 agency workers. “We are confident that simlar to PLDT, PAL and PAL Express will also be found gulity of illegal labor-only contracting and thus be ordered to regularize its thousands of agency workers and reinstate the PALEA 600. This will mean that justice has been served PALEA’s fight, just like a conviction for Solidum today,” Rivera argued.